Bake a sheet cake the size that you need. If the cake is going to have a lot of details, I will use the parchment paper transfer method which I did here on this Mickey Mouse birthday cake. If not, just use an icing filled bag and round tip, size #5 and draw Mickey on the cake top. Cut the cake away from Mickey's shape. There was so much cake cut away that I decided to use the pieces as cheese all around Mickey Mouse. If you decide to do this, don't place these until Mickey Mouse is all decorated. You will be using the star tip, size #18 to do all of the fill in work and the round tip, size #7 for all of the outline work. Using black icing, outline Mickey Mouse. Change to the star tip and fill in all of the black areas on Mickey. Now use white icing and fill in the rest of the eyes, the buttons and the gloves. 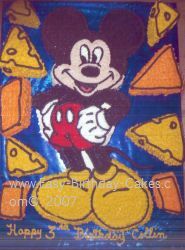 Mickey's pants and tongue are filled in with red icing. His feet ar filled in with a bright yellow icing, and his face is filled in with a light pink. Use your black icing and the star tip to make his tail on the board. If you want to do the cheese just shape the pieces you cut away to look like pieces of cheese. Outline them in black icing and fill them in using golden yellow for some and bright yellow for the others. See another Mickey Mouse Cake.